In the 1300's in England, one of the brightest minds of Europe began to study deeply into the word of God. The man’s name was John Wycliffe. He began to see that the system of works, penances and relics in the Church of Rome was leading people in the wrong direction. Wycliffe studied the writings of Paul very carefully. Wycliffe saw that people are saved, not by doing works and acts of penance, but by the blood and grace of Jesus. This Reformer saw good works coming as a result of faith. Wycliffe's followers, the Lollards, spread his messages through the British Isles and over into Europe. In Europe, God was preparing other people to uncover the same truths and take away compromises with Paganism. In 1512 the great Martin Luther nailed a protest list of "95 Thesis" he thought needed changing to the door of the church at Wittenberg. Many German princes supported Luther, but the state church hated his new discoveries from the Bible. Luther was tried by the Emperor, but God protected him. Another "Reformer", John Calvin, who had been trained as a lawyer, also studied very deeply. He wrote the now famous "Calvin’s Institutes". Though Calvin's writings still did not remove all of the compromises in the Church of Rome, they still contained much truth. The Reformed and Lutheran churches began to bring true Reformation to Europe. But, some of the Reformation churches began to persecute the people who were taking the Reformation on further. Some of the Reformers came to North America. 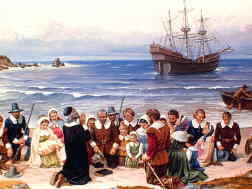 The Pilgrim Fathers fled Protestant persecution in Europe. Slowly the concept of "religious freedom" developed in Rhode Island with Roger William's. He himself had suffered persecution for his beliefs right in North America. Miller was right about nearly everything he taught. Miller discovered many wonderful truths, but he made one serious mistake. Miller thought the cleansing of the "Heavenly Temple" around 1844 would be God cleansing the earth by fire. Miller’s preaching seemed to be led by God. Thousands gave their hearts to God. 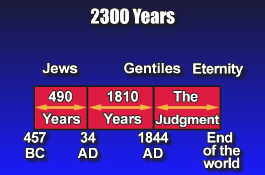 But 1844 came and went and Jesus did not come. The Millerites had made one important mistake. 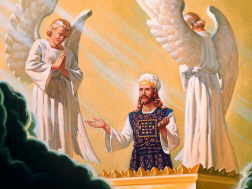 The "temple" to be cleansed (made right or pure) was not the earth being cleansed and Jesus immediate return. The "cleansing" was a new and special work Jesus was beginning in Heaven. Jesus would blot out the record of man's sin in Heaven in a special judgment before He returns. Go to the Next Section: God Calls a Remnant to follow more of this drama!